Once you’ve determined how Video Marketing fits into your overall business Strategy and determined what kind of Storytelling will best engage your target customer, it’s time to shoot your video. This post will run down what you need to know when it comes to creating a video for your small business, whether you’ll be behind, or in front of the camera, or both! It’s a lot of information, and we’ve broken it down into chapters so you can feel aware and prepared going into your DIY shoot. We tell stories, we invent stories, we share stories, and we make stories up. It’s how we communicate and relate to each other on a daily basis. 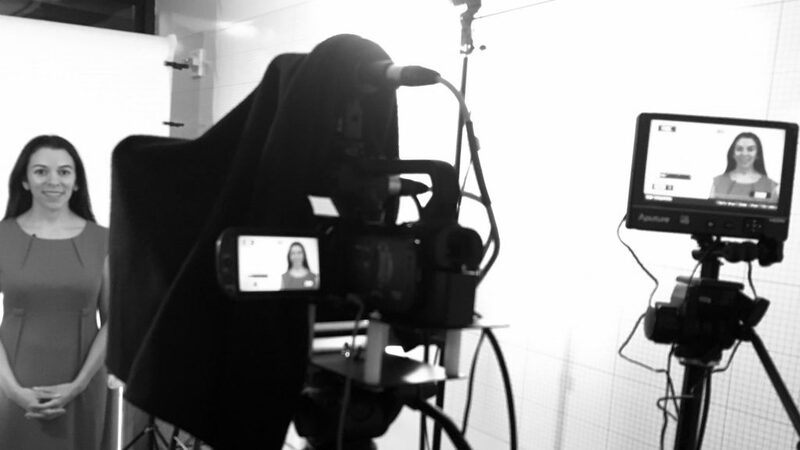 So, why are so many business owners petrified of telling their company’s story on video? We’re just sharing what we’re up to, right? So, how do you remedy being stuck on telling your story on video? This is where your previous work determining your audience and your strategy come in handy – if you have a no clue what I’m talking about – read our “Video Marketing Strategy” blog post. At which step in the buying cycle are you addressing your audience? What do you want your audience to do when they finish watching the video? Your video marketing storytelling should lead to a single goal. Which is yours? Are you introducing your company and your motivation for what you do? Are you offering a time-sensitive special? Are you explaining a new feature or product and why it is superior to your competitor’s? Even if your video isn’t “teaching” something, make sure your video has depth and resonance. Give your viewers a chance to connect with you and what you stand for (or what you sell). If you’re selling a product, show the product while you tell the story about why you are selling it. If you’re selling a service, then you are the product! People are buying working with you. Show them the product: You! And, tell them your story. I have a writer friend Michael Katz, who insists on doing screen-recordings and voice-over. That’s his thing. I think he would look great on-camera, but he’s chosen that style because it plays to his strengths and admittedly, he does have a great voice. I love this kind of video for a small business, especially if you are a service provider. If you sell a product you can even do a tip series on that product: How to take care of it, use it, and work with it. Or you can talk about something related to the product. I was hugely worried about coming up with content, but once I found a chapter structure for the 22 videos, it was so easy to come up with expert tips, because I’m passionate about sharing my knowledge and helping small business owners and I’ve been doing this for a while (decades…). Over the years, I’ve looked at hundreds and hundreds of videos produced by fellow small business owners and “internet sensations” and what good videos have in common isn’t that they are perfectly produced, but rather that they have a sense of authenticity. The most successful videos display energy, personality, sincerity, and a value proposition that resonates. Keep in mind that even the most authentic videos will inevitably have their critics. You cannot please everyone, there will be those who are attracted to your (video) personality and those who are not. When digital marketing and social media giant Gary Vee speaks, some people just roll their eyes and others soak up each word. He has a huge following. Why? He puts out great value with each piece of communication AND he’s got a personality to boot. Then there’s the incomparable Casey Neistat, filmmaker and YouTube sensation. 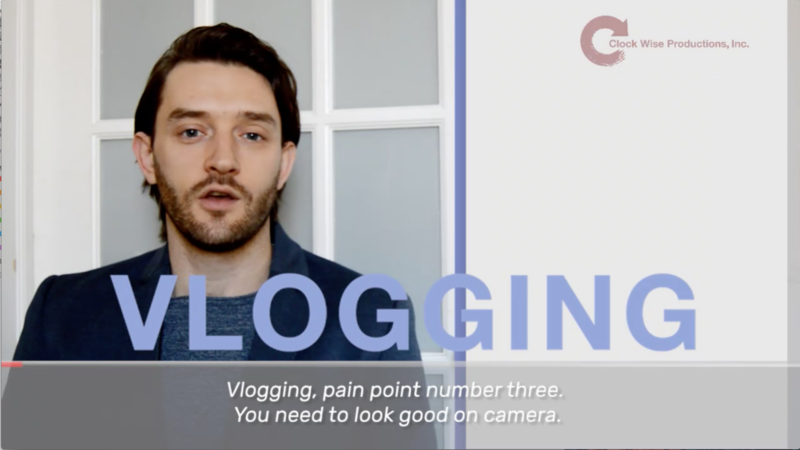 Casey’s Mega Vlogs fun, sometimes messy, and – although casual on the surface – very well produced. He’s real, authentic, energetic, and mesmerizing to watch. And not everybody has a bubbly personality. Some quieter voices, like Roberto Blake will appeal to a different set of viewers and maybe at a different scale, but they are still out there and getting traction. I like that Roberto offers reliable, and solid advice on all things digital creation. He has a consistent, quiet but engaging way of roping you into his world. And his channel is growing by the day. When I started with my own video marketing efforts it took me a moment to catch on. I originally produced “perfect” videos with backdrops and teleprompter and it took me a day and a nervous-breakdown to shoot two short videos. Then I started to shoot my own Vlog (video blog) with my iPhone, unscripted (but prepared! ), casually sitting at my desk, no lights (just daylight from a window), and guess what! I got feedback, I go reactions, I got clients… Because I was authentic, myself and natural. Scripting is the hardest part of the video marketing journey to get right and unfortunately, it’s the part you need to nail for the rest to fall into place, especially when it comes to storytelling for video. “Print and video are definitely two different animals. I find when I’m writing narration for video, my sentences are shorter and more dramatic. I get to the point faster. I read everything aloud to make sure it flows off my tongue easily. The hardest part is finding the balance between telling a compelling story and keeping it moving. When talking to someone in person, I like to lengthen or shorten a story as needed, taking cues from my listener’s body language. But when it comes to video, you have no feedback loop and so it’s best to keep things short and to the point. When I write a script for my videos – and I RARELY write scripts – I read them out loud about 10-15 times to make sure they sound “real” even after a lot of repetition. I often cut more than half of my text out and still get the message across. For my expert-tip-series I have up to three (no more!) talking points on one topic (and a narrow topic at that!) and I will shoot as many times as it takes until I say it “perfectly”. Why? It saves me headache and time in editing. And, consider this: On social media, or your website, no one wants to watch a video that’s longer than 90 seconds, and you need continuous content, so make what you have to share into as short as possible single pieces to give you more videos to put out there: Win-win! CONSIDER: SHOULD YOU HIRE A COPYWRITER? We all write – most of us actually quite a lot, between emails, newsletters, content creation, text messages, and social media posts. As we search for our business’ stories and best ways to share them, I wanted to call attention to the mechanism of actually WRITING down those stories. My advice has always been that there are two positions to consider filling with professionals even if you’re totally bootstrapping your video marketing efforts. One of them is a creative helper, a CD (creative director) sometimes known as a copywriter. I once hired a company out of London called Creative Copywriter to help me with some of my writing for the website and two introduction videos. Writing short-form copy is hard and when you are selling with CTAs (call to actions) you need to be very precise in your communication. I was too close to my own material to see what potential customers would understand and what would make them seek more information about my business. A fresh set of eyes, or a fresh brain was very helpful. I had been putting off working on my home-page for far too long, so hiring and paying a writer was going to be my ticket to end that procrastination. 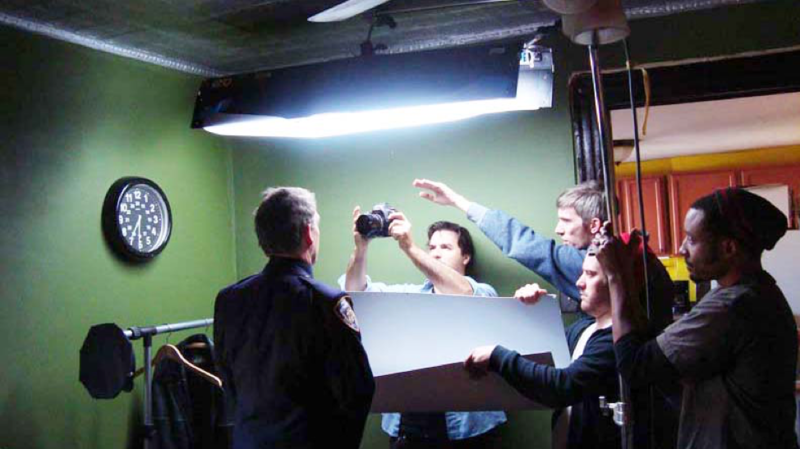 First and foremost: Writing for video is a specialty skill. Make sure you hire a writer who has experience and ask for completed video samples. If you don’t love them, don’t hire them. Allow enough time (and budget) for a copywriter to get to know you and your business. To speed up the process, hire a copywriter who either has experience writing for your niche, or is your target audience. Don’t be shy to interview several copywriters. If you go with a company over a freelancer, make sure you interview the writer who will be assigned to you before you make a commitment. Set enough of your time aside to go through what the copywriter has written and give detailed and extensive feedback. Having someone else write for you is not necessarily a time-savings. It’s an outsourcing of skill, not time. Similarly, allow enough of your time to write a full brief to make sure your writer knows where to go with his or her copy. Finally, don’t be shy to redirect a writer. They want and need your feedback to do their job well, so tell them what works and what doesn’t. Let the copy ‘marinate’ a bit. I like to sit on it for a few hours, or even a day or two to let it sink in. You might very well have some ideas or feedback that needs time to emerge. If you want REAL success with your video marketing, make a commitment to be consistent and publish continuously. Consistent content will make you part of your prospects or existing clients life – you publish reliably and consistently, and they will share your content, recommend you, and when they’re ready to buy, you will be at the top of their minds. Continuous content will give your prospect something to come back to and continuously learn from you. Be that reliable source with great advice, funny anecdotes, or fast tips. Be that expert voice and show them why they would absolutely want to work with you. For example, Susan Combs, CEO of Combs & Company, has an extensive video library; from CEO interviews, to white board explainers, and meeting coverage. What’s interesting is, that she has all her video series bulk-produced. This not only saves time and money, it also gives the videos a look-, tone-, and content continuity that speaks to the commitment she has made to becoming a likable expert in her field. It’s sets her apart from her competition, opens doors far beyond pulling in additional leads. Have a look at her different video series and you’ll get the picture. Giaco Whatever: “I make things” is his tag-line. He creates really awesome to-do videos – consistently, and it pays off: He’s super close to 500K followers! Upgrade to 1st class documented by Casey Neistat: Hysterical: And don’t be fooled – it’s expertly shot and edited. At the end of the day, storytelling is always going to be the hardest part of video marketing, and we often make our lives harder than need be. Follow the advice above and you’ll be well on your way to great storytelling for your business. Click on photo below for Thanksgiving video! A few years ago, as I started focusing on video marketing for small business, it all seemed crystal clear to me. 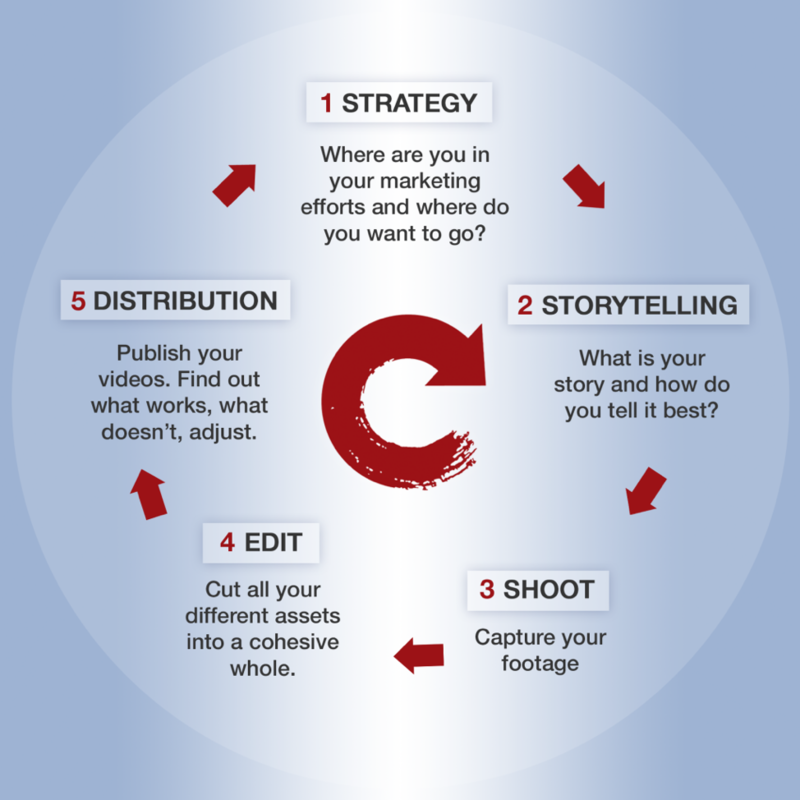 There were five stages of video marketing: development, creative, pre-production, production, and post-production. Those categories were what I knew as a filmmaker. As you can see, these five steps did not include strategy, distribution, or analytics! Since, I have come to realize, that what I knew about back then was video PRODUCTION, not video MARKETING. Today, after years of hands-on experience, I have a clear understanding of what a small business owner needs to know to be successful at video marketing. My focus has shifted from sharing all that I know, to sharing what clients need to know for a successful, sustainable, cost-, and time-effective video marketing strategy. If you have a brand to promote and target audience to reach, video is still the best tool to get beyond the noise of everything else on social media. And as we discussed in a previous blog post, Video Marketing strategy really begins with figuring out how and where you will distribute your videos. It should be no surprise that social media channels have become a huge part of that distribution. If your videos live in Social Media your strategy will change – sometimes rapidly – as social media usage and rules are constantly in flux. Previous blogs I wrote on this topic are still big-picture relevant, but the details, such as video length and format, are already helplessly outdated. For instance, for SEO the former all-important keywords no longer hold the weight they did only a few months ago and Twitter now allows for videos 140 seconds long, where before they capped it at 60 seconds. 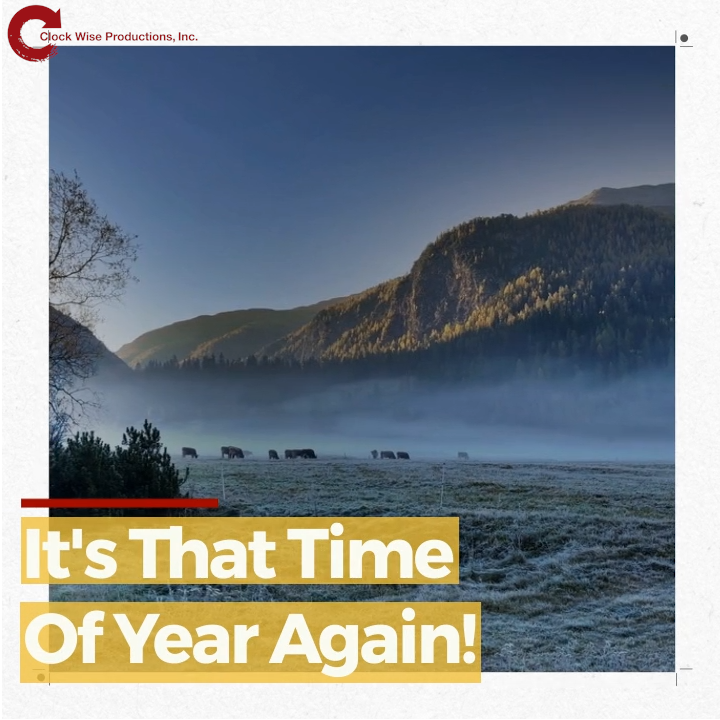 This means you will find yourself – most likely – re-doing, finessing, re-shooting, and re-editing the same content repeatedly as you react to channel changes, overall trends, and consumer behavior. And you, as a small business owner, will need to pivot much more often with your content and offerings as well. You know that awesome feeling when you teach something and then it totally lands? Last year, I taught a class at a Bronx high school for an EDsnaps summer program run by Susanne Cappendijk. Her daughter, Lisanne, listened to my class and then went off and made this video from scratch. I love every frame of it! So, I called Lisanne and asked her what she had learned in my class and how she applied it, and where her challenges where. Turns out that this video is a collaborative effort. The photos were shot during the program. The second round of interviews and with the girls, as well as the interview with her mom, where shot by Lisanne, who was given pointers by the teacher I had taught. Editing took her about 3 full days – which sounds about right for that amount of footage and for being a novice. Lisanne was surprised how long it took just to look through all the footage. Let alone organize it and plan on how to use it! I know! Lisanne is a fantastic example of how with a little guidance, you can create a great DIY video for your organization or business. Throughout this blog post, I will provide you with what you need to know and consider when organizing your edit, choosing editing software/apps, and what to consider when you’re thinking of hiring a video editor. This post will run down what you need to know when it comes to creating a video for your Small Business, whether you’ll be behind or in front of the camera, or both! There’s a lot of information, but I’ve broken it down into these chunks so you can feel aware and prepared going into your DIY video marketing shoot. Looking for and finding a good spot to shoot can make or break the “quality” look and feel you may want to portray of yourself and your company. Modeled after the steps that a location scout will go through on a professional video shoot, I’ve created this simplified checklist for finding your DIY video location shoot. I’ll go deeper into some of the steps below (background, lighting) in this guide, but if you don’t start off with a decent location then you’ll be setting yourself up for a more difficult experience than necessary.